Cancer is one of, if not the most serious disease in the world. Small wonder, then, that scientists are in a look for an effective cure for this disease. Chaga mushroom is one possible solution for cancer. This article talks about how the Chaga fungus can be used to treat this disease, as well as its other health benefits. What is the Chaga mushroom? The Chaga mushroom (Inonotus obliquus) also known as the birch mushroom, cinder conk, and the tinder mushroom, is a type of fungus that resembles a lump of burnt charcoal. A parasitic fungus, it can usually be found attached to birch trees, and is indigenous to cold northern climates. A tree with an attached Chaga mushroom will usually die within 5-7 years, because the fungus absorbs the nutrients out of the plant. This has earned the fungus the moniker “birch cancer” in Russia. While it is harmful to plants, Chaga mushroom is actually quite beneficial for humans, and is in fact considered as one of the oldest medicinal herbs, having been used for over 4,600 years by indigenous people for medicinal purposes. It is for this reason that the mushroom is sacred herb to Native Americans. The mushroom has also long been used in traditional Chinese society for medicinal purposes and to enhance overall well-being, as well as to prolong life. Unlike other kinds of ancient herbal remedies that have long been disproved by science as having actual medicinal benefits, scientists have found out that Chaga mushroom really can help treat illnesses, particularly cancer. The key to the effectiveness of the fungus against cancer is betulin or betulinic acid, an enzyme secreted by birch trees. The acid, when processed by Chaga mushrooms, has chemotherapeutic properties that fight tumors to prevent them from growing. Antimutagenic properties also prevent cancer growth. Betulinic acid protects DNA from oxidative damage caused by cancer. Chaga mushrooms can also help induce DNA repair to heal the damaged cells. Finally, betulin can also slow down metastasizing of cancer cells. Scientists are now experimenting with the fungus in cancer research. So far, studies have shown that the mushroom can help treat breast cancer, liver cancer, uterine cancer, and gastric cancer. Its effectiveness has led some people to nominate Chaga mushroom as the strongest anticancer medicinal mushroom. In fact, there are even some doctors who already recommend their patients to take Chaga mushrooms as complementary medicine, either to help treat or prevent cancer. Because Chaga mushrooms also have antiviral properties, it could be a possible remedy for HIV. The Chaga mushroom is an effective remedy for various ailments, including gastritis, ulcer, tuberculosis, fungal problems, and parasitic conditions (such as intestinal worm infestation). The mushroom can be taken to boost your immune system by increasing the amount of leukocytes. These are produced by the body to protect it from several ailments. Chaga mushrooms have the highest oxygen radical absorbance capacity (ORAC) out of all the other kinds of natural food today, having a higher ORAC than even Acai berries. Diabetics can take Chaga mushrooms in order to lower and regulate their blood sugar levels. 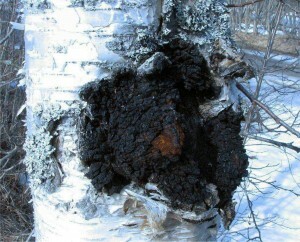 The Chaga mushroom is harvested once its outer surface swells, resembling burnt coal, with its texture resembling cork. Traditionally it is then be grated into powder form and brewed to make a beverage similar to tea or coffee. More effective way to use Chaga mushroom is its extract. The mushroom is simply boiled in hot water to extract its nutrients. While this is the easiest and most economical way to extract the nutrients, the non-water soluble components of the mushroom, such as betulin and phytosterols, will be lost. This process will isolate the non-water soluble components of the mushroom, which will then be used for medicinal purposes. Fermentation is the most expensive and complicated process to extract the nutrients in Chaga mushrooms, which is why it is the least common method. Commercially available extracts usually use a combination of hot water and alcohol extraction to produce the extract. Cheaper products may use only hot water extraction method, meaning they wont contain all the active components. The Chaga mushroom has progressed from being a traditional herbal remedy to a viable solution for the prevention and treatment of various serious ailments, particularly cancer. Scientists are quite hopeful that new tests will show just how effective this fungus is in treating these illnesses.